Headhunter sunscreen was started in 1989, by Doug and Drew Littlemore of La Jolla, California. These two surfing brothers were working as boatmen on Tavarua at the time, and were constantly tortured by the tropical sun. They decided they needed to make a truly waterproof sunscreen that could survive intense surf sessions. They often label their products as surfscreens over sunscreens, because they are specifically formulated to give you the most protection from the sun while surfing. Headhunter sunscreen is some of the best stuff out there for today’s daily surfers. A while back now, Chris wrote a post about Ocean Potion’s Face Sunscreen. I used Face all the time for sun protection while surfing in Hawaii last winter. However, right before coming back to California for the summer, I was exposed to the Headhunter Face Stick. This sunscreen is the best working of any that I have tried yet. 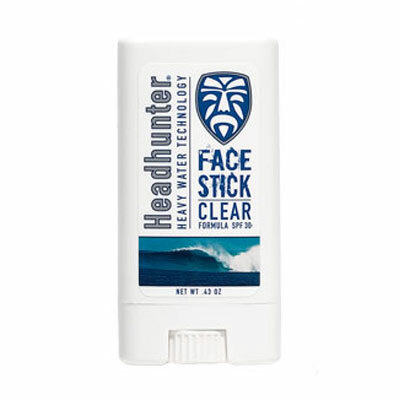 Unlike the Face sunscreen, the Headhunter Face Stick stays visible on your skin until you wash it off. Headhunter’s owners say this is so you know its still there and hasn’t washed off on its own in the water. The Headhunter Face stick is designed for those with fair skin or those who will be exposed to harsh sunlight for a long period of time. I got my own Headhunter Face Stick after testing it out, and now I use it almost every time I surf for a long time during the middle of the day. The Face Stick looks like a mini deodorant stick, and you apply it in much the same way. This makes for a hands-free application. The formula that I bought is tinted brown so it isn’t as vibrant and noticeable as other zinc-oxide formulas. Two other nice qualities about the Face Stick are that it is small, fitting easily into a pocket of your boardshorts, and it can be applied in the water. You can always just keep it in your pocket, and if the sun comes out and you’re feeling exposed, you can pull it out and apply it while surfing. I am really pleased with the Headhunter Face Stick, and am sure that it will be something I use much more in the future. The only downside is that it is much more expensive than the Face Sunscreen and others on the market. For the little .43-ounce stick, it will cost you around $12 to $14. As small as .43 ounces sounds though, it does last for a long time. I have barely dented my first Face Stick and I have been using it every day for 3 weeks. So if you don’t mind having visible sunscreen smeared all over your face while surfing, then this is the some of the best stuff around to protect your skin.